-- Please Choose an Option --	Car Seat Restraint - FREE! The Chest Plate distributes the load evenly across the dog's chest rather than the throat, to make walks enjoyable for both you and your furry friend. With an EVA chest support that moulds to the shape of your dog, every harness becomes a custom fit - there really isn't a more supportive and comfortable dog harness on the market. 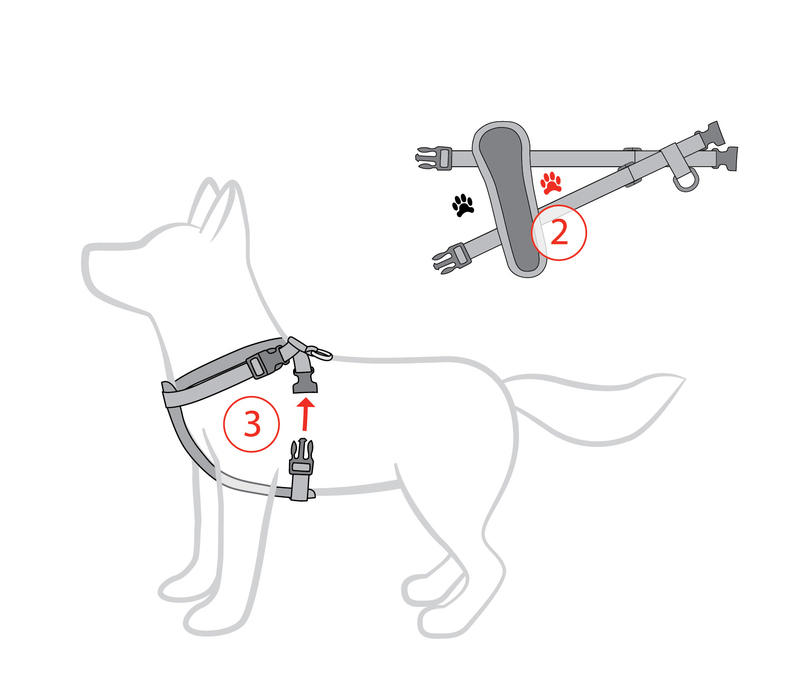 Thanks to the easy to adjust straps, the harness does not rub uncomfortably anywhere on the dog (Click the 'Fitting Instructions' tab to correctly fit your Chest Plate to your dog). The iconic shape of the chest plate itself has been meticulously designed and tested to fit every dog type, so whatever your breed - the Chest Plate Harness is the perfect choice. The one-click snap clips means that the harness can be put on quickly and with minimal hassle. The easy-to-adjust straps ensures that a snug, secure fit can be achieved whatever the dog size . "Great harness for controlling a pulling dog. Making walking a pleasure"
"Easy to use, and take off and put on. Awesome product"
"Easy to put on, my Goldie’s didn’t even mind it on! Came quick in the mail! Large was perfect size for them. " "Bruce and Dusty D Dynamo Dawg"
"this is our 5th purchase of chest plate harness for my small dog. In the beach and river water twice a day every day. long lasting quality item that gets so much use and works a treat. no signs of discomfort as my dog runs, jumps ,swims and runs amok. "I have two Boston terriers and because of their shape they more difficult to fit for a standard harness. Having used another brand of harness for years I decided to try the ezydog chest plate harness for both dogs and a cujo lead for one of the dogs (who pulls hard). I ordered them and they promptly turned up the next morning. we are thrilled with the new harnesses - providing a great fit and better control - not sure why it took so long to try them!! We have been using the ezydog dog collars and leashes for years and found them easily the best quality at very reasonable prices. " "This harness is very simple to use, simple to put on, seems comfortable and strong. Very happy with this harness." "Best harness ever!! I had to buy another one though because it got left outside and another dog chewed it up lol. " "This harness is by far the best that that I have ever used for my dog. Great quality and extremely well made. I feel confident that my dog is comfortable and safe while using this harness. Thank you EzyDog! " "We purchased 2 harness's for our two beautiful Chocolate Labradors. Unfortunately we under estimated the size of one our babies and had send one of the harnesses back for a bigger size. We recieved our XL harness and the exchange was seamless, excellent Service. We now have outstanding control when take the dogs for a walk.Exellant product,well made and very comfortable for the dogs." "This harness is amazing quality like all of ezydog's products. It fits my sighthound perfectly."